0800 Numbers are to be free to call from mobiles! OFCOM are intending on a shake up of the current charging, which can be somewhat confusing concerning 0800 numbers when called from mobiles. Ed Richards, chief executive of Ofcom, said: "There is clear evidence of widespread uncertainty and confusion about the cost of calling these numbers. Consumers need to have far more transparency about the price they are going to pay for calls so that they can make more informed choices and so competition can work more effectively. 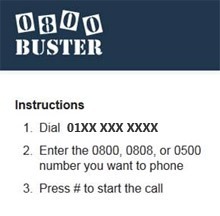 0800Buster provides alternative access numbers for making cheap calls to 0800, 0808 and 0500 numbers. When dialling one of its landline numbers you'll be connected directly to the number you want to call, bypassing the costly freephone number. Go to the 0800Buster website and look for the landline number on the left-hand side under "Instructions" (this will start with 01 or 02). It has hundreds of numbers, and a random one is chosen each time you visit the site (if you clear your cookies), hence we haven't listed any specific ones here. Next, save the number on your mobile, so you can access it every time you need to dial a freephone number. 0800Buster says you can use the same number again and again. Call it, and when prompted, tap in the 0800, 0808, or 0500 number you want to connect to, followed by #. See here for info on how to save the number to your phone. Doing it this way you'll only be charged for a UK landline call, which will be free if you have inclusive minutes with your tariff. WARNING! Make sure you follow the instructions carefully. Some MoneySavers have reported that calls have been charged for, as they have pressed the green call button after typing in the freephone number. This causes the first call to be put on hold and the call to the 0800/0808/0500 number to be charged as a separate call.